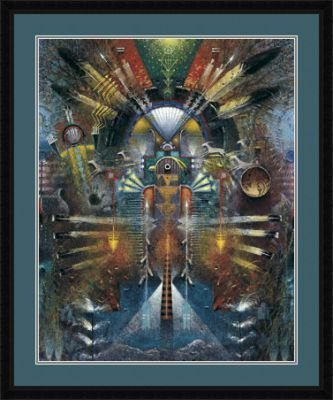 Native American symbols offer us a complete and reverent language of life, nature, and spirit. This language is unmatched in its depth and power. This language derives it's power from the fact that American Indians viewed all things - whether seen or touched - living or inanimate - as possessors of a spirit. Further, they recognize that everything in the universe holds a deeper meaning. As a result, all objects and beings deserve one's attention and respect. 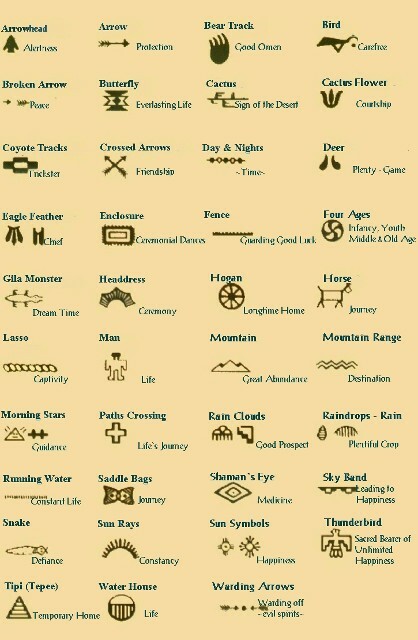 Therefore, Native American symbol meanings are an integral part of the Indian life. 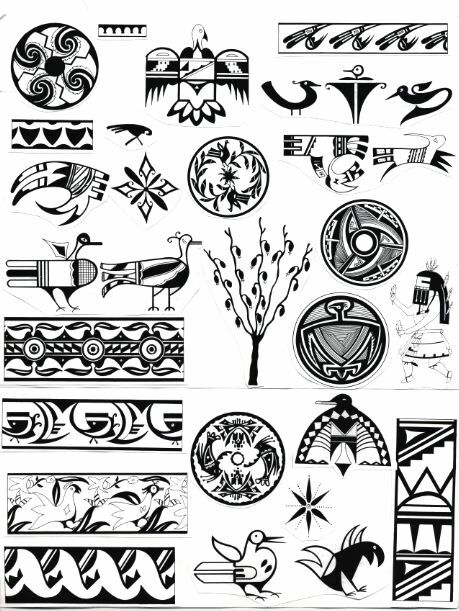 Native American symbols bring concepts to mind that surpass words. 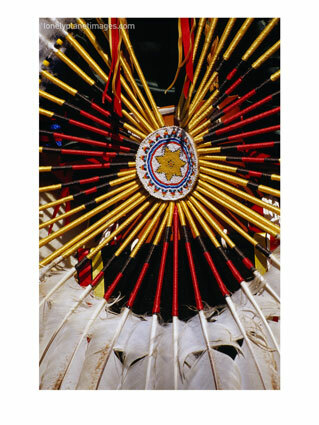 Feathers, depicted in many, many ways, are symbols of prayers, marks of honor or sources of ideas. 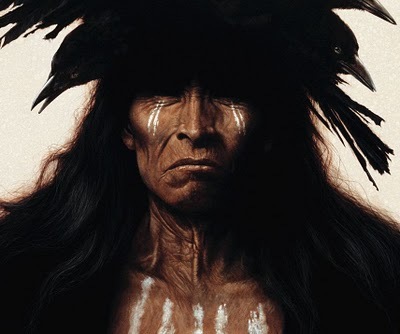 They represent the Creative Force, and are taken from birds connected with the attribute for which they might be utilized: goose flight feathers to fledge an arrow because of the long flights of the geese; Eagle feathers for honor or to connect the user with the Creator, Turkey feathers to decorate a kachina mask. As design elements, they mau appear plain, banded, barred, or decorated. 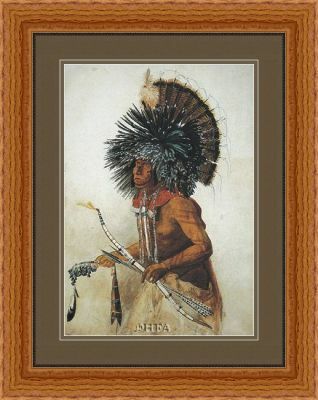 Pahos or Prayer Sticks, are carefully notched and painted cottonwood or cedar sticks with specific feathers attached to catch the wind. They are planted in the ground at religious sites, and at springs to carry specific prayers to the Creator or to the Kachinas. 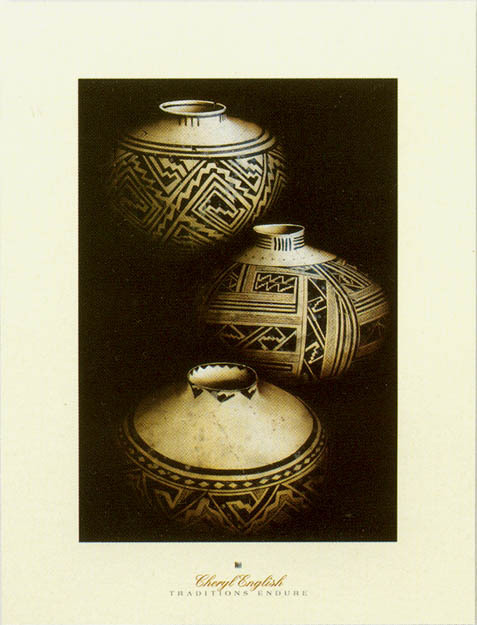 Their forms are found in many Pueblo and Navajo designs. 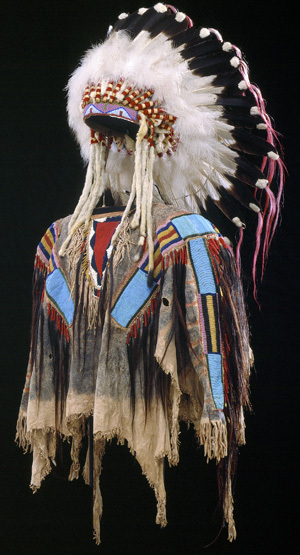 Circular Feather Arrangements are found on pottery, in masks, prayer fans, dance costumes and on Plains "war bonnets" They are also used in decoration on buffalo hide "counts", or story depictions in paint recounting war honors, times of historic contact and other important periods of time. In a circular arrangement, they are related to the sun, and therefore, to the Creator. Bear, Directional Protector (West), physical strength, leaderrship, also frequently mentioned as "first helper", in creation/emergence stories. Deer, Hunting prey animal, sacrifice and also mentioned as "first helper" in some emergence stories, family protection and speed. Horned Lizard, represents lizards. 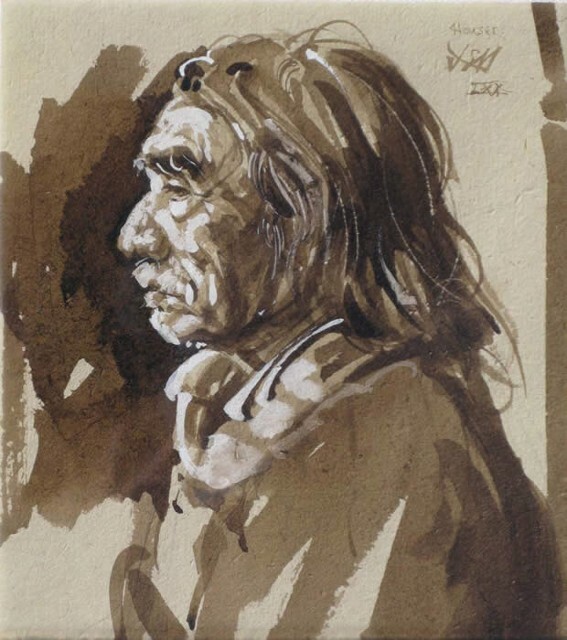 Also significant in some Navajo stories connoting perseverance and keeping ancient secrets. Some say "they'll steal your eyes if you look at them too much!" They also are found in Coyote stories as ones who annoy Coyote. Tadpole, immature frogs also connote fertility and renewal. Because they change, they are considered very powerful. Turtle, water animal, strength, female power fetish animal, fertility, long life, perseverance. Considered to be able to defy death, and is also an annoyance to Coyote. 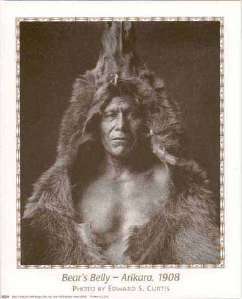 Coyote, the trickster is also a powerful hunting prey god and fetish. keen ability to find things, and is often considered an omen that something unpleasant might happen. 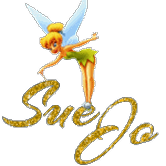 This whimsical, new style, is an outgrowth of the popularity of the Santa Fe style, during the early 1990's. 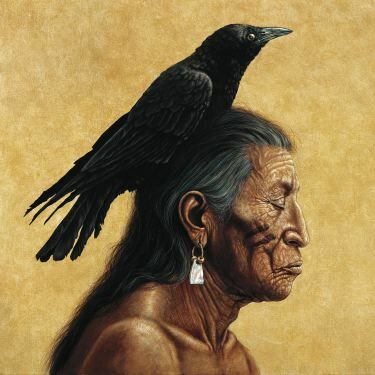 This howling style with bandana is a copy of a cottonwood folk-sculpture first created by Santa Fe artist Ricardo Rodriguez and later mass-produced ad nauseum by anyone who wanted to sell something to the tourists. 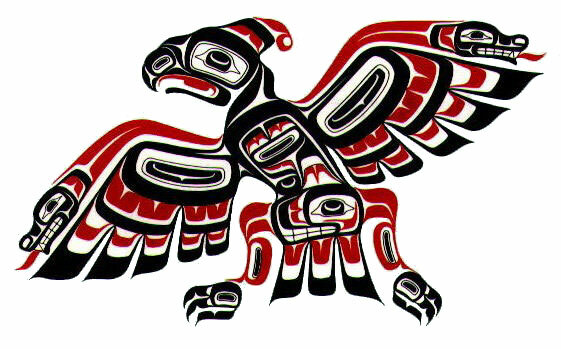 Water Bird, symbol of renewal of life, wet seasons, rivers distant travel, long vision, wisdom. 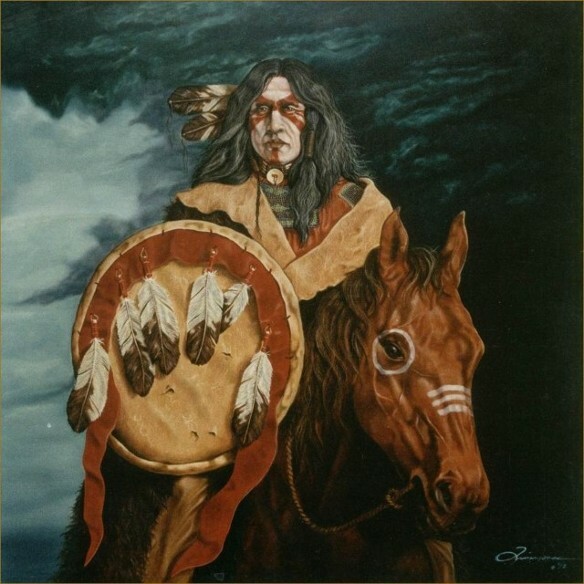 often inaccurately called "thunderbird", which is not a Southwestern tradition, but rather one of the plains people. In that context, connected with lightning, thunder and visions. 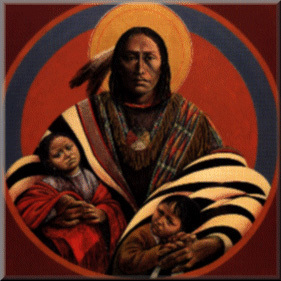 Those who dream of the thunderbeings must become Heyokas -- those who live out their dreams backwards (Lakota tradition) The image has also been modified and used as the symbol of the Native American Church, founded by Commanche Quannah Parker around 1910. Hummingbirds (paired), also sometimes waterbirds, or quail, symbolized in mated pairs as symbol of devotion, permanence and eternity, life cycles. These are often modified in many, very simple forms. Hummingbirds are particularly known to be ferocious fighters and defenders of their territory -- many times stroger than their small size would indicate. Parrot, connected with both the sun and with the coming of the rains. Parrots were considered carriers of these specific prayers and would confer blessings. 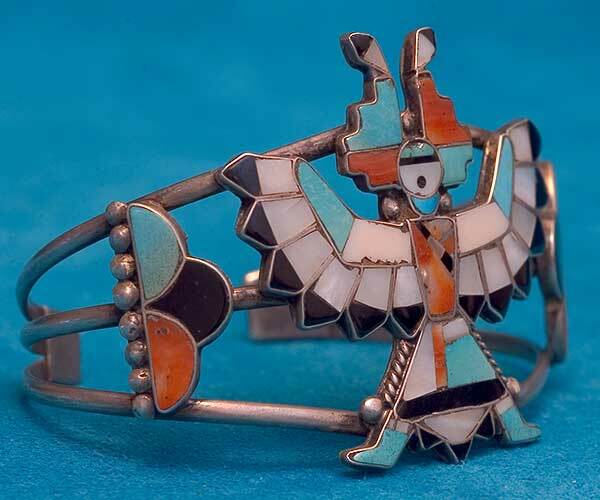 Kept for their feathers and color, by many Pueblo people (secured through trade with people to the far South), and also considered a very expensive possession thereby denoting prosperity. Crane, also connected with water and the end of summer, images of migratory fowl like Sandhill Cranes are common in pottery and petroglyphs from the Mimbre culture in Southwestern New Mexico. 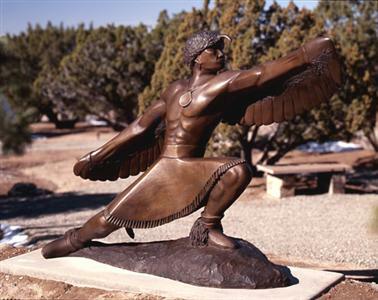 Turkey, and important food source, also is mentioned in several Tewa Pueblo stories. Its feathers have many ritual uses. 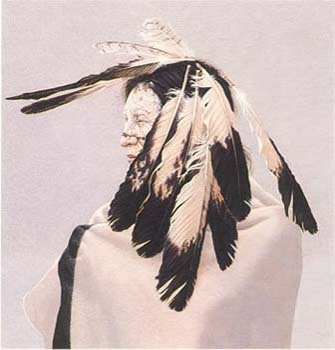 Owl, among the Zuni and Keres Pueblo people, the owl is respected as the guise of departed, wise elders and leaders' spirits. A silent hunter, the owl is connected with darkness and night as well as keen eyes and skillful hunting. 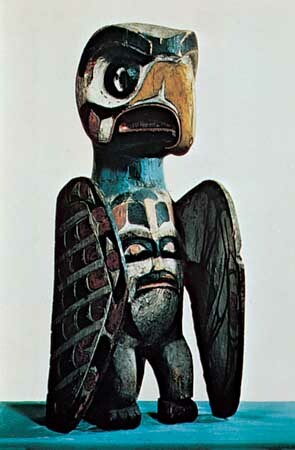 Among most other cultures, the owl is considered a bad omen, portending death. 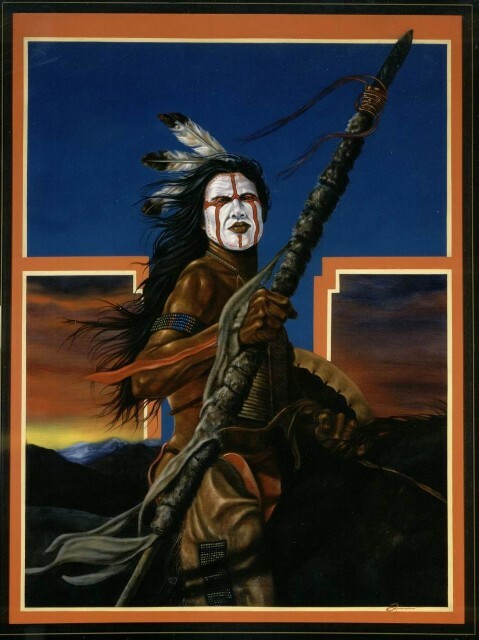 THERE ARE OVER 500 TRIBES AND VAST TYPES OF NATIVE AMERICAN ART. IT WOULD BE IMPOSSIBLE FOR ME TO COVER THIS. THE LINK HERE TELLS THE DO'S AND DON'T'S ABOUT BUYING THIS ART. GOOD RULES TO FOLLOW IF YOU WISH TO BUY. 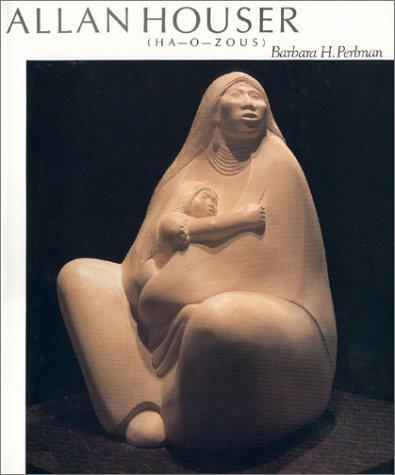 feel that you have to spend thousands of dollars to enjoy Native American arts and crafts. Posters and more mass-produced items still make nice gifts and decorations, and there are lesser known artists who produce less expensive pieces. Just like oil paintings or bronze statues, you can spend $35 or you can spend $35,000. Know what the purpose of your purchase is--investment art? collector of a certain artist's work? Souvenir? 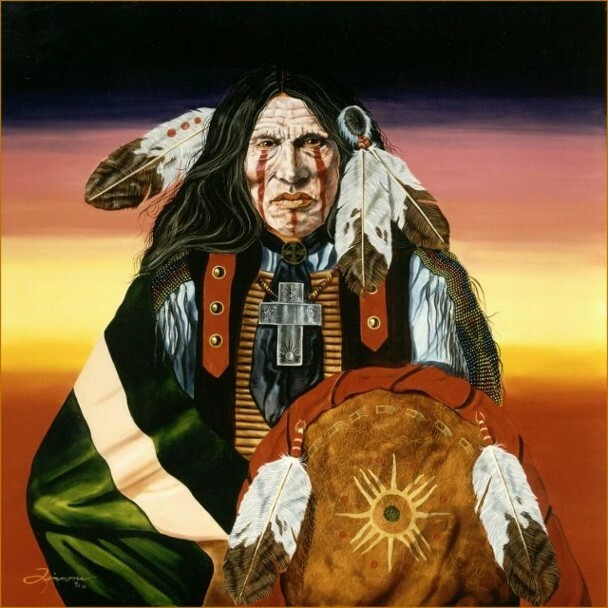 Kirby Sattler is a contemporary artist whose paintings reflect his inherent interest in the Native American People. 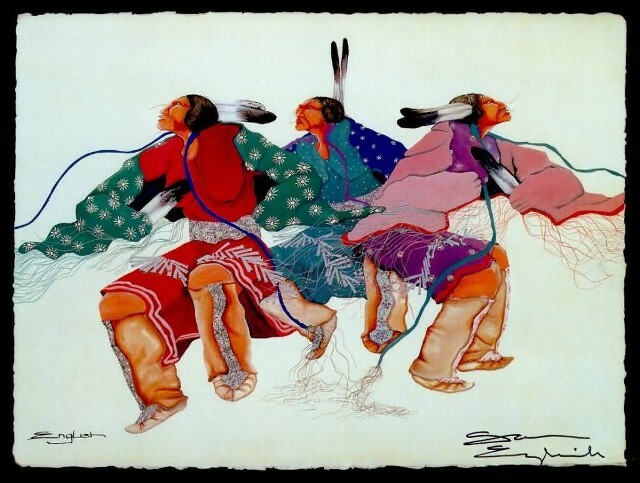 He interprets his art in the multidetail of the spirituality, mythology, history and ceremony of the Plains Indian. 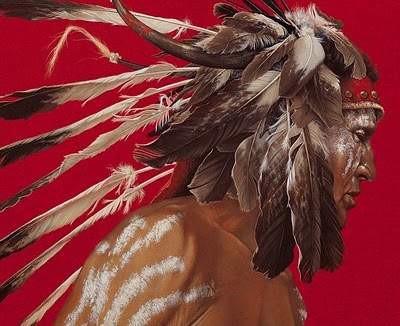 His artistic interpretations speak of the inseparable relationship between the Native American and the world he lives in. A world in which the sacred and the everyday are blurred into similar beliefs. A world in which respect for the land, the animals and the people are held with the same reverance. 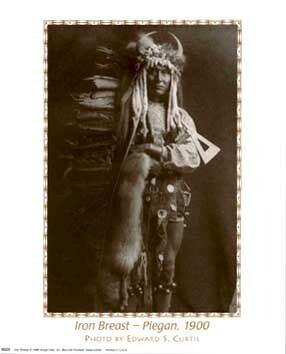 Excellent - Like New Condition Teddy Weahkee was the first to use Mosaic Inlay inside a channel. Mosaic Inlay is stone against stone. collectors alike. Rarely does it come to market. 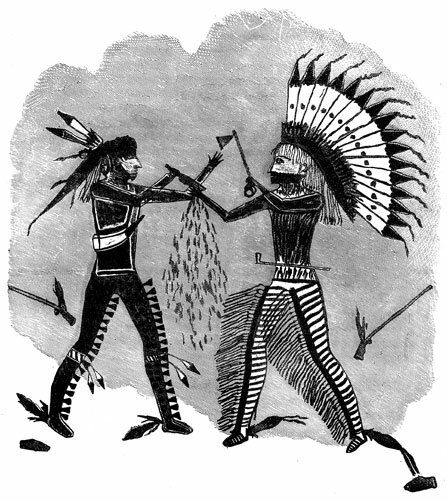 Did you know...the very first "United Nations" agreement, where national growth was NOT by conquest or forced subjugation but where independent nations joined together, was between the 5 original Iroquois Nations! The belt BELOW memorialized Houdaunosee, the League of the Pine Tree and was formed before European contact. This idea of peaceful federation influenced the formation of the federation that WAS TO BECOME the United States. 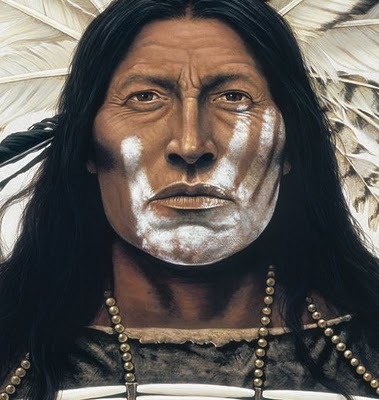 The idea of a peaceful, cooperative over-government, uniting disparate but still sovereign (for local issues, customs, and government) nations and populations is the most important contribution of Native Americans to others of the world today! 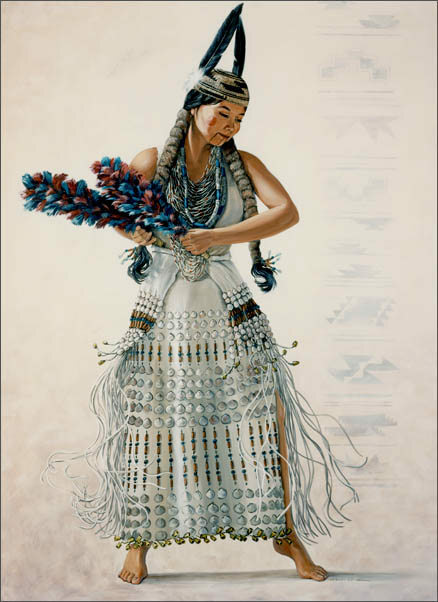 Native American beadwork consisted of making, wearing, and trading beads of shell, pearl, bone, teeth, stone, and fossils. And this was about 8,000 years BEFORE the Europeans crossed the Atlantic! 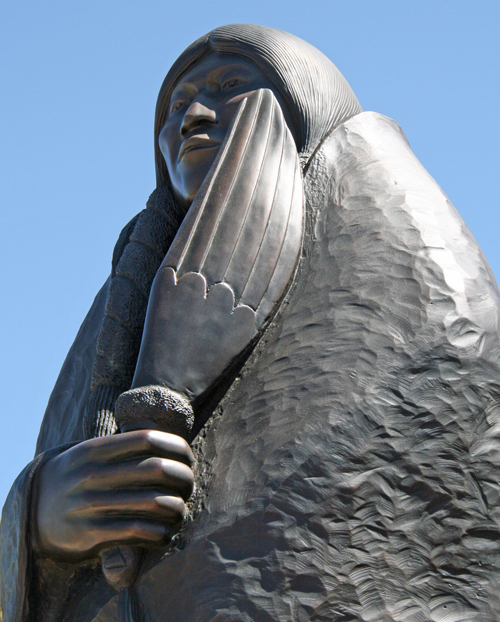 Angela Babby was born in Everett, Washington where her father was employed with the Bureau of Indian Affairs. 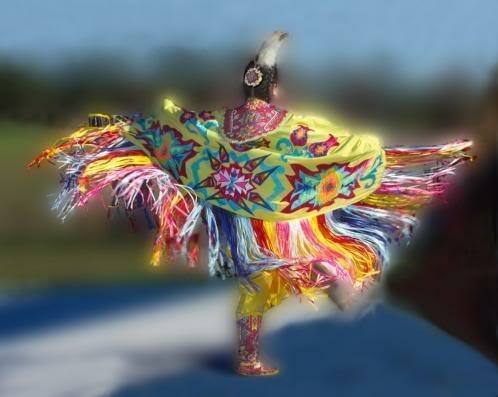 The family is from Pine Ridge, South Dakota, where Angela is an enrolled member of the Oglala Sioux tribe. By the time she was in high school in Oregon Angela was committed to a career in art. After earning her degree in art at Montana State University-Billings in 1990 she returned to the Seattle area where she was featured in her first single artist show, an exhibit of watercolor paintings at the Virginia Inn. 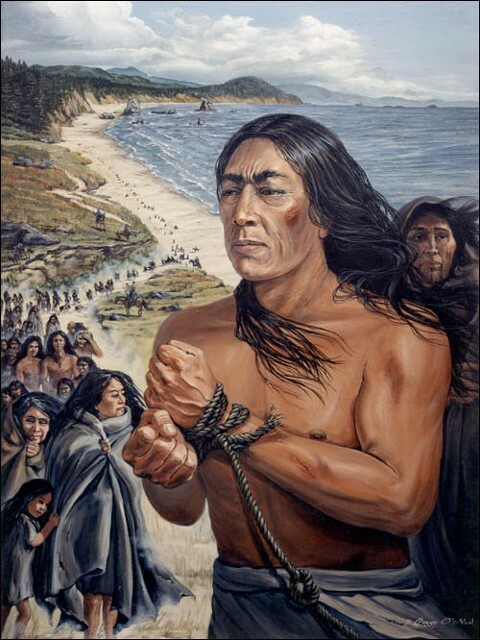 Allan's father was among the women and children jailed at the Castillo de San Marcos in St. Augustine, Florida, and Allan's mother was born in the prison camp at the Mount Vernon Barracks, Alabama where surviving members of the tribe were sent in 1887. As a final solution, the last of the Chiricahuas were sent to Fort Sill, Oklahoma where they remained captives for 23 years. 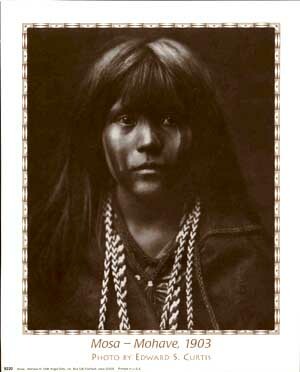 Freed at last in 1914, a majority of the tribe returned to New Mexico to join with the Mescalero Apaches for whom a reservation had been created. Allan's parents, however, were with a small group of families who chose to stay in Oklahoma and create farms in the Apache and Lawton communities. Allan was born just months after their release, the first child born out of captivity.